If you follow this blog at all, you will know that I don't attend many blogger events. If you follow my Instagram feed, you'll know that last night I did. Generally I shy away from the "monetise your blog" crowd, and have never joined in a Twitter party. You won't find me shouting out about turkey brands, feminine deodorants, family-sized vehicles, or the like - mainly because it's not something I'm comfortable with. My idea of writing for a living is being paid for the quality of my words, not how much I can jump up and down online about product A, B or C.
I don't get many PR requests - if you check my blog you can easily see that I don't run many of the requests here. My Wee Guy and I reviewed an event at the Vancouver International Children's Festival a few years ago (btw, it's coming up soon - at the end of May) and we stomped our Palladium boots into the ground, giving them a thorough road test (Wee Guy grew out of his pair before they gave out - almost a year of almost continual wear and the soles were a bit thinner, the zips still worked, and the leather was comfortably soft = winners! please send another pair to try out). And that's about it. So why the event last night? Well - it was a Klout perk. My score was high enough to gain access to a blogger evening at Metropolis at Metrotown (the first private brand Klout party in Canada no less!). And I thought, what the heck! I posted, I tweeted, I Instagrammed ... I replied, thanked and hashtagged my way through the evening. But now - what else do I do? What's the etiquette? I had a lovely time. The music was great (thank you ms DJ). The nibbles were super. The sponsors were a lot of fun (especially the dancing Benefits cosmetics group) ... but what's my call to action here? 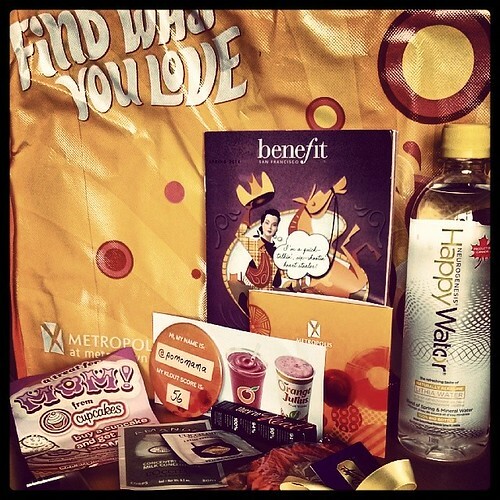 spt8may14: #METROPOLISxKLOUT I don't really do blogger events but this was fun thank you!